Geo. B. SUDWORTH, American Forestry, Vol. 10, 1910, p. 88-90. APPROXIMATELY nineteen species of cypress are now known in the world. Eight species occur in the United States. Five of these grow in the Pacific region, two in our South-west, and one species in the South Atlantic and Gulf Coast region. The others inhabit Mexico, Lower California, eastern Asia, portions of the Himalayas, eastern Mediterranean countries, and southeastern Europe. They are trees of very ancient origin. Remains of them have been found in the tertiary period of the earth's history in Greenland, white subsequently the cypresses appeared in western Europe, in which, however, they are not now represented. All of the cypresses (exclusive of Taxodium) are grouped either under the genus Cupressus, or divided between this genus and Chamaecyparis. The true cypresses belong properly to the genus Cupressus and comprise the species found in Lower California, Mexico, Arizona, California, south-western Asia, China, the Himalayas, and southeastern Europe. This group of cypresses is characterized by large, thick-scaled fruit, which matures in two years, and produces numerous wingless seeds. The remainder of the cypresses, which may be included under the genus Chamaecyparis, differ from the true cypresses in having very much smaller fruit, which is matured in one* season, and produce only a few seeds with thin papery wings. The cypresses important for their timber are our Pacific Slope species, the Lawson Cypress and "Yellow Cedar," the White Cedar of the Atlantic region, two Japanese species, the Himalayan Cypress, and the Pyramidal Cypress of southeastern Europe and southwestern Asia. The latter Old World species (Cupressus sempervirens) hag doubtless been known longer to civilized people than any other cypress. It does not exist now in the wild state, being preserved only in cultivation. The ancient Romans carried this cypress from Greece to Italy where they planted it extensively. The exceedingly durable wood is said to have been used by the Egyptians for mummy cases, while the doors of the Roman temple of Diana and the statue of Jupiter are believed to have been made from the wood of this cypress. Up to the present time but one cypress, Cupressus arizonica, has been known to inhabit Arizona. It occurs mainly on the Santa Rita, Santa Catalina, and Chiricahua mountains. It is also said to occur on the extreme eastern part of San Francisco Mountain. Careful explorations are yet required to definitely outline the range of this species, which was discovered as recently as 1882. This cypress is characterized by a rather thin, somewhat stringy, anastomosely furrowed bark of dark red-brown color. In strong contrast with this rough-barked character, is the perfectly smooth bark of the cypress recently found by the writer on the north slope of Verde River canyon in Yavapai County, Arizona, and for which I propose the name Cupressus glabra. The trunks have throughout a very thin, smooth, dark purpled-red bark. Each year's growth of bark (from about one-sixteenth to one-eighth of an inch thick) breaks up into small, curling plates, which on all vigorous trees fall away during the succeeding late autumn and winter. The tree attains a height of from thirty-five to fifty feet and a diameter of eighteen to twenty inches. It is probable that considerably larger trees occur. The branches, particularly of younger trees, are strongly upright and form a compact, narrowly oval or somewhat pyramidal crown. Old trees, grown in the open, develop long lower branches which, from their great weight, are often much less upright than in old trees in a dense stand. The spherical mature fruit is from about seven-eighths to one and one-eighth inches in diameter, and composed commonly of six (exceptionally eight) scales. The scales are armed with conspicuous, incurved, somewhat flat-pointed, bosses. The matured cones are smooth, but conspicuously wrinkled and covered with a deep, blue-gray bloom which, when rubbed off, reveals a rich, dark brown color; very old cones are ashy-gray. Cones of one season's growth, also smooth, are often light reddish-brown, but with areas of pale bluish bloom. The cones are borne on stout stems from one-fourth to one-half an inch long. Ripened cones remain unopened on the branches from fourteen to eighteen years, possibly even longer, the seeds being retained during this period. To what extent the seeds preserve their vitality during this time is at present unknown to the writer, who has not yet had an opportunity of testing these old seeds. The red-brown seeds vary in form from a triangular to a rounded and somewhat rectangular shape. They are from three-sixteenths to five-sixteenths of an inch long, the larger dimensions being more common. The foliage has a bright blue-green (glaucous) aspect due to a pale bloom on the leaves. The leaves on old sprays are (about one-sixteenth of an inch long) closely pressed to the twigs, acutely pointed, thickened and keel-shaped on the back, and nearly all bear a resinous pit (gland) on the back. Young shoots bear closely pressed leaves from one-fourth to one-half an inch long, but with very keen spreading points. The leaves die during the second year, turn a bright red-brown and remain on the twigs for about four years; later the twigs and small branches become ashy-gray. Male flowers are abundant, but as yet the female flowers have not been discovered. The wood of this cypress is exceedingly durable in an unprotected state; even the sapwood bas great durability exposed to weather and soil. Cabins built of the logs forty years ago are still in a good state of preservation, while fence-posts and corral poles show but little decay after twenty years' exposure. Marked durability of this wood is in contrast with the wood of Cupressus arizonica, which is not particularly of lasting quality. The sapwood of C. glabra is a pale straw-color and the heartwood is a very light brownish yellow. The wood is hard, heavy, usually very fine-grained, and when freshly cut it has a slight cedar-like odor. As known at present Cupressus glabra ranges from an elevation of about 3,700 feet to 5,500 above sea level. The Verde Canyon forest is about six miles long and about one and one-half miles wide. The trees are associated more or less at lower elevations with Pinus monophylla, and Quercus chrysolepsis. Higher up, except in the drier areas, the cypress forms the principal tree-growth. It chooses a north slope entirely, growing best in protected watered gulches and on the sides of shallow canyon, but it occurs also on the intervening benches and ridges where the shaley soil is moist. Unquestionably this cypress will later be found to have a much wider range. 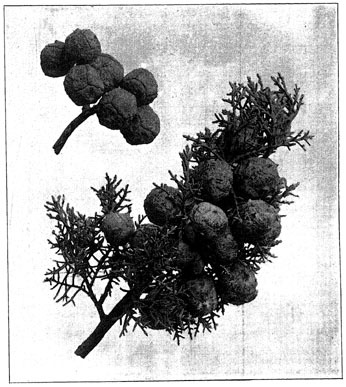 It is probable that the large grove of "Arizona cypress" described by Prof. J. W. Toumey (Garden and Forest, VIII, 32) in 1895 on Pine Creek at the "Natural Bridge" in central Arizona is Cupressus glabra. Prof. Toumey appeared at that time to doubt that this Pine Creek cypress was the same as the one (Cupressus arizonica) found in the Chiricahua Mountains. He notes, in the case of the Pine Creek trees, that the bark "peels off in long shreds," a character not observed in the Chiricahua trees. Arthur H. Zachau, Forest Supervisor, who had seen both the Chiricahua and the Verde River cypresses noted the marked difference in the barks of these trees and called the writer's attention to the northern cypress in 1907. It was not, however, until December, 1909, that the writer found an opportunity of investigating this tree. The few settlers seen who know this cypress call it "yew-wood," because its smooth purple-red bark resembles that of the northwestern yew, Taxus brevifolia. *Our so-called "Yellow Cedar" (Chamaecyparis nootkatensis) may prove an exception to this. Trees planted in England are said to show a biennial habit of fruiting, but convincing proof of this is still lacking. Further careful studies are being made of this and other members of this group in order to settle the doubt, recently raised.